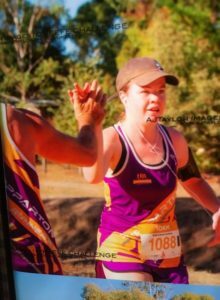 Tara taking on the challenges at The O’Keefe rail trail fun run. Their was a Pb, heat, hills, and Melanie, and I beat all 4 of them. I am going to dedicate a wall at home for photos of all the people I beat over the coming years. 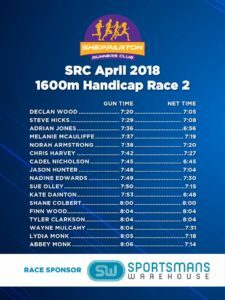 Watch out for me at the Shepparton Running Festival where I will take on and beat Steven Trevaskis in the Half marathon. Our weekly Tuesday sessions at the Athletics track have concluded. Our Tuesday sessions will now be down at the lake. 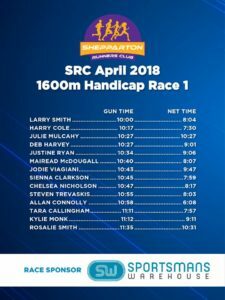 The Shepparton Runners Club will discuss with council our plan of hiring the track once per month. When we know the outcome of these discussions we will let you know. The Shepparton Runners Club would like to wish Sue and Andrew a safe trip overseas. Sue will be doing some Parkrun tourisum starting in Germany. And if she gets time between shopping and parkrun she may catch up with her son while they are there. You will be a part of the 40th running of the event and it should be bigger and better than past events. 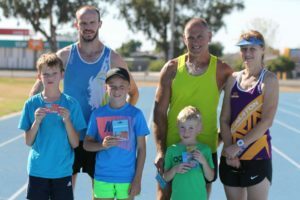 May 19 Euroa Parkrun launch. Nail Can Hill Run course. Course: The Full Can course is run mainly along the ridge of the Nail Can Range that borders Albury on the west side. The distance of the run is 11.3km. The route consists mainly of fire access tracks with short sections of gravel and bitumen roads. The course is marked with kilometre markers and directional arrows and lines. Walkers can expect to take up to 3 hours to complete the course. Please make a note of the hydration and first aid stations. 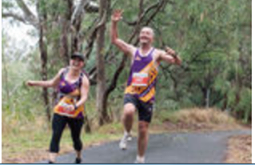 This is the third time I have ran the half at the O’Keefe Challenge and unfortunately experience has not made the long climb from Lake Eppalock into Heathcote any easier. After cramping in both hamstrings at the 23 km mark of last year’s 26 km event I went into this year’s run armed with energy gels, salt tablets and some weird muscle relieving veterinary cream recommended only for use on horses and dogs but high regarded by the Coach. So as long as I wasn’t drug tested I was confident I would be fine. We arrived at first light in Heathcote with a slight chill still in the air, perfect running weather for someone like me who is known to perspire in a heavy frost. If only it would stay this cool. Unfortunately the forecast was for a sunny 28 degrees and I could already sense that it was going to warm up quickly. A quick farewell to the support crew who were running in the shorter events later in the morning, and I boarded the bus along with Kate Dainton and Steve Trevaskis for a short trip out to the start line at Knowsley, a trip where the bus’s heater seemed to be stuck on a temperature equivalent to the North Queensland Wet Season, great I’m sweating on the bus ride! A quick warm up run to shake out some nerves, a prerace gel, a salt tablet, one last gulp of water and then it was time to line up. Bang! We were off and within 2 kms the field had thinned out and I found myself running with a group of four other runners and then there was seemingly a huge gap back to the next group. A quick glance at my watch, I’m running about 10 seconds a km quicker than I had initially planned but on the upside I felt really comfortable and I was determined not to drop off this group otherwise it would make for a very long lonely run. To the newbie, the first 5 kms of the O’Keefe half lulls you into a false sense of security as it is relatively flat or slightly downhill as you run into the basin surrounding Lake Eppalock, but it bites you back with a vengeance over the next 11 kms as the rail trail changes to a constant climb all the way to Heathcote. It was during this climb that my group of five spread out with about 50 m between each runner. Gels at 7 & 14 kms and another salt tablet and water at every drink station and I felt comfortable, sweaty but comfortable. Finally the climb flattened out as I entered Heathcote but then I had the mental torture of running past the finishing line knowing I still had 5 kms to go. Despite having to do this, I was 16 km in to a 21.1km race and I felt surprisingly good so I decided, ok there’s only an equivalent of a parkrun to go, time to pick up the pace. I put the foot down and my legs responded, for a short time anyway! 16.5 kms, how quickly a race plan can change! Bang! As I ran down an incline from a footbridge my left hamstring spasmed, contorted and turned into the equivalent of piano wire. 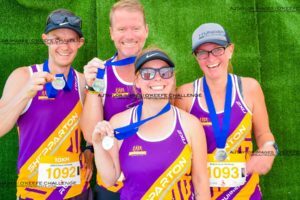 “No not again!”, I mentally cried out, whilst at the same time verbalising some other choice words, words that I had not heard since running with Kate Dainton at the conclusion of the Wangaratta Half. After apologising for the language and then reassuring a marshal that it was just a cramp and I hadn’t torn my hamstring I broke back into a trot and then a jog then back into a slightly slower restricted run. Race Plan A was now scrapped and Race Plan B was now in place, just get home. The last 5 kms were a battle, every little incline or decline triggered a hamstring spasm. The tail runner out of the group of five I had been running with caught me with 1 km to go and told me to lock on and follow him home, somehow I managed to do this and we crossed the line within a couple of seconds of one another. In summary I finished the 21.1 kms in 1:42:16, in lucky 13th place, and 5 minutes quicker than what I managed the equivalent half at last year’s event. I now have 12 months to plan a new strategy to beat mother nature and get through this event unscathed! With very little training I fronted up to my 3rd half marathon in 3 months. 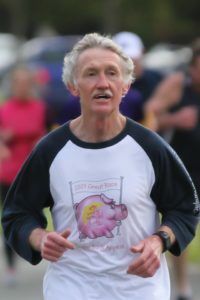 At Wangaratta my 5 km splits were all consistent between 32 and 33 mins each. Today was on a rail trail, with undulations longer than Albury and it felt hotter. My past 2 halves were between 2:22 and 2:23 mins. Today was tough, my 5 km splits were 32:33, 33:55. 36:27, & 36:41. I knew I was walking too much after 10 km to get a time close to the previous 2 halves. The arm didn’t cause an issue at all. The knee only hurt when I changed from walk to run. All other times their was very little pain. So I am content with 2:26:29 as a finishing time. After the run, we did a few calculations to predict what time Kathy and Narelle would come in. We knew their times were getting slower and this was a fairly tough course. 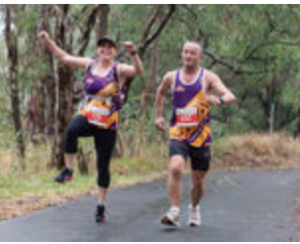 It was great to see SRC members waiting around to cheer Kathy and Narelle to the finish line. Let’s just start this off by saying that I made the decision to enter the O’keefe Saturday night. My nutrition the night consisted of Steak, Vegetables, Potato Mash, followed by ice cream and a glass of Port. There was no specific training in the lead up, but was confident I could do the 10km without any issues… hopefully. I registered, got everything set (batman was safely secured), had a drink of water and then waited with everyone else. The field wasn’t large, I figured I would sit behind Sam and let him do the pacing, if it didn’t feel right, I would just slow down. About 4km everything was feeling really good, so I passed Sam and figured I would catch the next person. Not long and I managed to sneak past the next person on an incline. I think having fresh legs really helped here. In the end I was very happy with how everything went. I should maybe adopt this principal in other races. Easy start, go comfortable and then pick people off along the way. But better nutrition and a bit more specific training in the lead up. Leaving Shepparton at an easy 7.30 last Sunday, we picked up Mat and Mel and headed to Heathcote for the O’Keefe 10km Trail run. After catching up with all the other SRC runners, we took off at 9.30, a relaxed time to set off. Starting off with trails after the footy feilds, a few road crossings, and into the hills. Nothing too extreme, it followed the O’Keefe Rail Trail, as we passed the half marathoners, hey Steve, keep going. Sam pulled in under 52 mins, and Tara got a 1 and a half minute PB, breaking the hour mark for the first time. We all hung around to support the marathoners Kath and Narelle and Grant cross the line, then went in search of much needed lunch. Last Sunday Mum & I ran in the O’Keefe Challenge 5km Fun Run at Heathcote. We got to Heathcote 3 hours before our start time as Dad had to get there early to catch the bus for the 1/2 marathon. To fill in some of the time before the start Mum & I went to the bakery where I fueled up for the run by having 3 meat pies and sucked dry the sauce container. After the person in the owl suit had finally got out of the way we were told to line up. I lined up on the front row. There was a loud bang and we were off. The course started on the oval but then went onto a gravel track that ran through some parkland and a pine plantation and then a bitumen road before we entered the oval again to finish. It was not flat and had lots of climbs and falls. I took off a bit quick and was in the lead for the first 3 kms along with a teenage girl, Charlie. Charlie passed me at 3.5 kms then at 4 kms, Peter, the man who came first, passed me. I locked onto Peter for half a km before he got away. I entered the oval again and I could hear Dad, Mathieu, Trevor and Sam yelling my name as I crossed the line. I had enough time to recover before mum came onto the oval and sprinted home. I had a fun day and came 3rd overall, 2nd male and 1st under 18 male. It was also good to see all the other Shepparton runners finish their races. Athletics track – Next Tuesday will be our last night at the Athletics Track. It has been great to run there as well as have our handicaps. Keep an eye out in the future newsletters and facebook as to where we will be training in May. Are you training for an event coming up? Defib training – St John has been advised by Department of Health & Human Services that we have been successful in obtaining a defibrillator for the SRC. One of their trainers will come out to the club to install the defibrillator and provide you with some training. We are expected to have a minimum of 5 and a maximum of 20 members attend the training session. The training session will comprise of a comprehensive overview of the defibrillator, CPR, Strains, sprains, wounds and bleeding, head injuries etc. 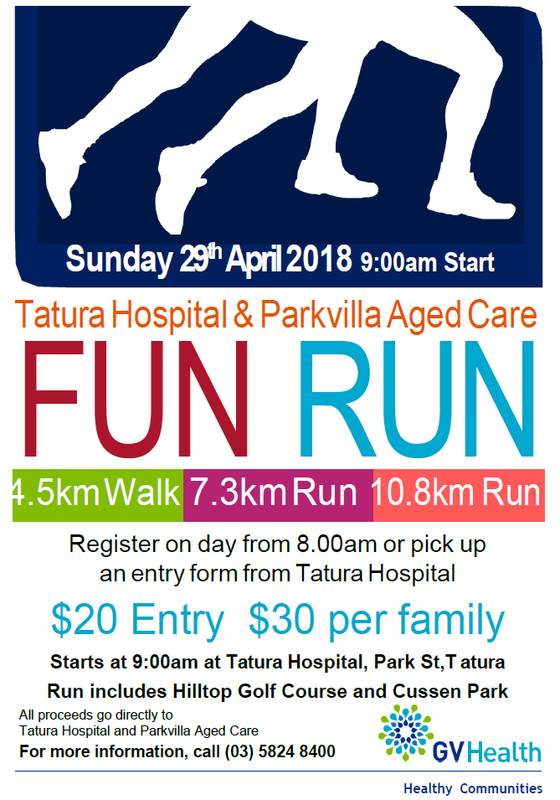 O’keefe Marathon and Fun run – Good luck to everyone racing this Sunday and watch out for Kathy and Narelle who are up to marathon No 4 for this year. Keep fit after finishing football. Typical training week – 3 runs, 2 rides, 2 swims. 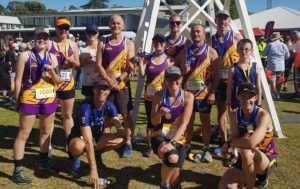 Goals – World Triathlon Age Group Championship on the Gold Coast in September. Biggest challenge is fully recovering from a recent injury. Biggest breakthrough in running. Breaking 3 hours for the marathon. Most enjoyable run would be City to Surf in Sydney because of the atmosphere. If I could run in any event it would be the London Marathon, but I would need a time capsule to take me back 25 years. I am inspired by every person who puts on a pair of running shoes, especially the ones who run Parkrun between 30 and 55 minutes. Best advice would have been – If you can,t say anything nice about a person, don,t say anything at all. If you need something inspirational, just watch the finish of the wheelchair marathon at the Commonwealth Games and listen to the interview straight after. Wow! What an experience of a lifetime. On 3rd November 2013, I completed my very first marathon. That is 42.2kms (or 26.2 miles). It was not just any marathon. It was the New York Marathon! Yes, New York, New York. The track for this run covers the five boroughs of New York. Staten Island, Brooklyn, Queens, The Bronx and Manhattan. Unbelievable. What better way to see the real New York? I’d decided in September 2011 that I wanted to run the NY Marathon. Why? Because I wanted to commit to running marathon and I figured that one would be a great one to do. 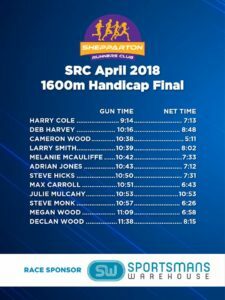 I questioned, Could a novice runner like me enter it? Could I train enough to get in? Could I train enough to finish? 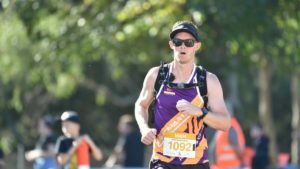 Did I have what it takes to run through the 42.2kms or 26.2 miles and still be standing at the other end? Did I even like running? Actually I love running. What I love about running is that you get to think clearly after a hectic day at work, you get to innovate whilst you run, you get to creative, you get to see things, you get to test yourself, you get to relax and listen to music and you get to enjoy experiences that come purely with running like problem solving about hydration. 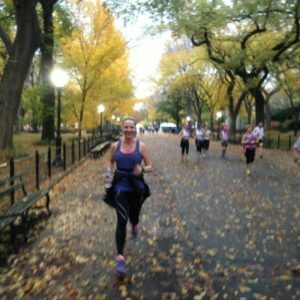 Could I enter the NY Marathon? 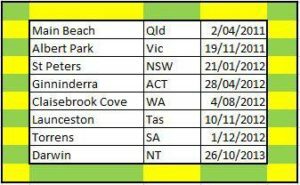 I investigated and found a travel agency in Australia set up for running marathons across the world. They did everything for you. Travelling Fit is their name. I contacted them to enter the 2012 NY Marathon. But it wasn’t that easy. I had to go on a waiting list for a few months as all the allocated tickets to that agency had been taken. So I was on a waiting for people to change their mind. Who would do that? I did not make the list for 2012 and was put on a priority list for the 2013 group. But the 2012 NY Marathon ended up being cancelled due to Storm Sandy. So in a strange way it was a good thing I missed out on entering 2012. I was so lucky. In February 2013 I got a call inviting me to commit to a spot in the NY Marathon 2013. My spot! I had to decide was I in or not? Yes, yes I am in! And so the commitment to training began. What was I getting into? Did I even know? Maybe not, but I was very excited. Continued from the SRC newsletter April 20, 2018. The plan was to commit to a 16 week program, but before that run regularly to maintain a base. (I had built a base over many years running many half marathons, so I was pretty fit). Early on I decided to run with some football umpires sprint training on a Tuesday night. Feeling very fit and ready, I did this training and loved it. Only to pull up the next day and week unable to walk due to strained quadriceps tendons.. first lesson learnt. Go slow and listen to your body… this thing will take a while to build up to. 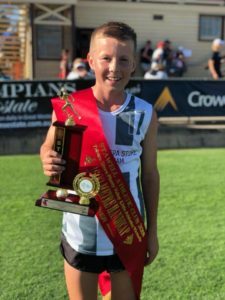 In June we moved about 15 kms out of Shepparton, Victoria and so where I trained, there was only 5 houses around, many trees, many cows, a few kangaroos jumping around in the afternoons, and some hares. The land is flat, there are bitumen and dirt roads and there are no hills. Very different to a big city that never sleeps. 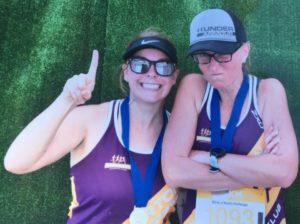 Although occasionally I’d go into town and run with a group of other really fit runners, either before or after work, mostly, my training was made up of me running to a training program for marathoners and fitting runs in around work and home duties. I was so happy to train for this thing and at times became overwhelmed with how lucky I was to be fit and healthy to train and also at how lucky I was to have my ticket to go. I just had to get the training right. At times it was tough, but I also knew that was part of the plan. In my training I had done a maximum of 36kms in training, only once but I had built up to the that distance week by week. I had stuck to my training but I had started to get really sore and strained calf muscles and so the last four weeks of training were not ideal as I had dropped off. But I really did think I had done enough. The goal, to finish between 4-5 hours. A lot did depend on the feelings on the day. About 50,000 people had entered to run the marathon. That is almost the population of Shepparton. The lead up to the marathon was amazing. I met many runners Australian, American and from all countries. All going to New York to experience the same thing. Many great stories, many sad stories and many stories of pure inspiration. One Australian lady I’d met at the airport was told by her doctor that if she ran she’d probably need a hip operation. So she decided not to run but came over to the USA with her husband and kids anyway to support the other runners and then extend their time for a holiday. There was a parade of nations the night before the marathon and it felt like the opening ceremony of the Olympics. They were even followed by a big fireworks display that only the Americans know how to do. The Travelling Fit guys walked us down and sat with us whilst we watched the whole thing. After the Boston Marathon bombings earlier in the year, there was a resounding respect for all those in or from Boston but a defiant attitude to be victorious in freedom and being able to run a marathon. Many people running in New York wore blue ribbons to support those from Boston. Speaking of Boston, the security in New York was high. The marathon expo and related activities all had a high level of security with guards and scanning equipment like at each airport. After the 2012 NY marathon had been cancelled many runners had maintained their training across the year and had returned with the hope of completing their marathon for the past two years. Many other runners were appearing for the first time like me. A few their very first marathon. A few their first New York Marathon. Others running their third, fourth or fifth New York marathon and so on. But for everyone this was a special day. The day we got to celebrate the freedom of running and the opportunity to test ourselves. How wonderful that every day people like you and I run this race and we can share it with the elite runners. The weather was cold that day. Approximately 1-9 degrees Celsius. We needed to get to the Staten Island first before the roads were closed off. The bus got us there. The Travelling Fit group had organised busses for the Aussies to get there. Wonderful, they left from my hotel lobby! So an early start, 5 am to be at the bus at 5.45 to get to Staten Island. The mood on the bus was quietly excited and smiles and sharing of stories for the 45 minute journey. Upon arrival there were many buses and stream of people entering the running village. Essentially we had a 3-4 hour wait depending on the time of the wave you started in. Everyone excited and ready. A beautiful feeling of support and effort. Respect for everyone around you. We all knew what it took to just get there to the start line. A bonus on the morning was that we saw Robert De Castella (Deeks! My hero!) and the Indigenous Runners Project group who were also running in the marathon. It was fantastic to be an Australian and see them. There were four distinct starting groups on the day. Each had a start time based on the capability and expected time to finish. With the elite runners going first, of course. This was fantastic because the group moved about the same pace and so didn’t feel crowded when we ran. At the start line, people were smiling and ready. I hadn’t done a long run for a few weeks and honestly was looking forward to getting it out of my system. A nice thought to start the run. And so, the gun went off, Miss America sang “God bless America”, and then a band sang “New York, New York” just as I set off over the start line… then over the first bridge overlooking the Hudson river with the New York city skyline just to the left and in the distance. What a beautiful city! How lucky was I? The Race. What was it like? What I thought it would be, it was. Long, gruelling, tough and testing my metal. It was a really cold day and very windy. The track – hilly. Having trained in kms I was going to be challenged by the mile markers, but found as the race went on, psychologically reaching something in the 20s was so much more doable that something in the 40s. How funny, it is exactly the same distance. The streets were lined with 1.5-2 million people, cheering on the elite runners, and the not so elite like myself. Yes, really. The celebration through every part of the run amazing. Bands and gospel choirs sang songs, people held up signs, one in particular saying “run like you’ve stolen something”, which was a bit dubious given I saw it in Brooklyn and in the Bronx. People offered food they’d made or fruit or drinks from the side lines, others offered smiles or claps, and others called out your name or your country based on what was written on your running top. It was like the whole of New York just gave us, the runners, a hug. During the run many people were struggling later in the race. This is when true spirit emerges. One guy fell over and had blood pouring from his face and hands. Another went straight to him and took him to the medical site, waited for him to be treated and then they ran over the finish line together. Many struggling not thinking they could make it, when a person in the crowd called out just the right thing to get them motivated and over the line. At the 25 mile mark when I was questioning why on earth I had signed up for this, a lady called out over the rope in Central Park “ you have got this! You are going great!” and smiled… an amazing smile. That is the smile that carried me over the line. I finished in 4 hours 27. I was happy to have finished the race. More than 12,000 volunteers lending their time and hands just to support the runners. They too amazing people. Volunteering their time to give you a drink of water, a banana or Gatorade on the day and standing in the cold for many hours whilst the elite to the last runner crossed the line. In itself a huge effort and commitment. There are so many people that supported my marathon journey before, during and after the event, to which I am grateful to them all both friends and strangers. Amazing in their own right. Thank you! My husband, my siblings, my mum, my friends, my team at work and colleagues (who all supported and believed I could do it) . I also met the lovely Kathy Fuller. Who I had not met previously and someone introduced me to her as I was doing “New York”. Kathy had run the New York marathon before me. I met with her and she gave me some tips and tricks, inspiration and excitement about the race. To this day we share a love of New York and it’s marathon. So the elite winners for the men’s and women’s race finished in a time of 2 hrs 5 minutes and 6 secs (Geoffrey Mutai – Kenya) and 2 hours 23 minutes and 15 seconds (Firehiewot Dado – Ethiopia) respectively. But those who finished behind them did not lose. They finished. That is a win in itself. This distance is tough. The effort taken just to get to the start line is big. To get to the finish line unbelievable. What I didn’t anticipate was everything that the race symbolised. 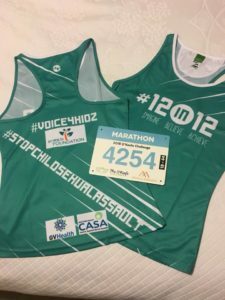 The marathon is about humanity. It is about extending yourself beyond what is possible. It is about extending yourself to the next person. It is about supporting the next guy when he thinks he cannot. Not only in running but in whatever he sets his mind to. It is about the journey of life, the highs and the lows. It is about setting a goal and taking what comes on the journey and dealing with it. It is about enjoying the good parts and toughing out the rough parts when your legs feel like lead and you remind yourself that you actually do love the challenge. It is such a mental challenge. It is about extending the human spirit and giving a little or a lot. A smile, a hand, a hug, a drink or wink. So thank you New York New York for embracing all the runners and giving me the experience of a life time. I wouldn’t change a thing.